Daniel Defoe’s 1719 novel, Robinson Crusoe, is a rich text for understanding the mechanisms of European colonialism and the relation between the colonizer and the colonized (represented by Crusoe and Friday). Defoe represents Crusoe as being the ultimate incarnation of an Englishman: industrious, self-determining, and ready to colonize natives. (See Anglophilia) Crusoe encounters a native and he names him Friday, teaches him English, the words of God, and slowly “civilizes” the dark-skinned native. 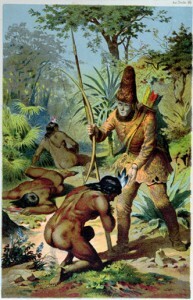 (See Colonial Education) Although the novel forecloses any possibility of understanding Friday’s experience, a reader could start to wonder how Friday’s relation to Crusoe affects his own sense of identity. In the novel, we only see Friday as mimicking Crusoe and civilization–but what effects does this mimicry have on a colonized subject and psyche? And how does mimicry and hybridity affect textual representation and signification? The term hybridity has become one of the most recurrent concepts in postcolonial cultural criticism. It is meant to foreclose the diverse forms of purity encompassed within essentialist theories. Homi Bhabha is the leading contemporary critic who has tried to disclose the contradictions inherent in colonial discourse in order to highlight the colonizer’s ambivalence in respect to his position toward the colonized Other. The simple presence of the colonized Other within the textual structure is enough evidence of the ambivalence of the colonial text, an ambivalence that destabilizes its claim for absolute authority or unquestionable authenticity. His analysis, which is largely based on the Lacanian conceptualization of mimicry as camouflage focuses on colonial ambivalence. On the one hand, he sees the colonizer as a snake in the grass who speaks in “a tongue that is forked” and produces a mimetic representation that “emerges as one of the most elusive and effective strategies of colonial power and knowledge” (Bhabha 85). Bhabha recognizes then that colonial power carefully establishes highly-sophisticated strategies of control and dominance; that is, while it is aware of its ephemerality, it is also anxious to create the means that guarantee its economic, political and cultural endurance, through the conception, in Macaulay’s words in his “Minute on Indian Education” (1835), “of a class of interpreters between us and the millions whom we govern – a class of persons Indian in blood and colour but English in taste, in opinions, in morals and in intellect” – that is through the reformation of that category of people referred to by Frantz Fanon in the phrase, “black skin/white masks,” or as “mimic men” by V.S.Naipaul. Friday could be one of these mimic men; but as we have already seen, the process of colonial mimicry is both a product of and produces ambivalence and hybridity. Bhabha explains that Macaulay’s Indian interpreters and Naipaul’s mimic men are authorized versions of otherness: “part-objects of a metonymy of colonial desire, end up emerging as inappropriate colonial subjects … [who], by now producing a partial vision of the colonizer’s presence” (88). What is left in the repeating action of mimicry, according to Bhabha, is the trace, the impure, the artificial, the second-hand. Bhabha analyses the slippages in colonial political discourse, and reveals that the janus-faced attitudes towards the colonized lead to the production of a mimicry that presents itself more in the form of a menace and rupture rather than than a resemblance and consolidation. Bakhtin, M.M.. The Dialogic Imagination. Austin: University of Texas Press, 1981. Belnap, Jeffrey Grant. The Post-colonial State and the “Hybrid” Intellectual. California: U.M.I., 1993. Bhabha, Homi. Location of Culture. London: Routledge, 1995. Brathwaite, Edward Kamau. “Creolization in Africa.” Ashcroft, et al. The Postcolonial Studies Reader. London: Routledge, 1995. 202-205. Chambers, Iain & Lidia Curti, eds. The Post-Colonial Question. London: Routledge, 1996. 9-11; 49-50; 134-5; 250-51. Hobsbawm, Eric and Terence Ranger. The Invention of Tradition. Cambridge: Cambridge University Press, 1983. Hogan, Patrick Colm. “The Gender of Tradition: Ideologies of Character in Post-Colonization Anglophone Literature.” Order and Partialities: Theory, Pedagogy and the “Postcolonial.” Ed. Kostas Myrsiades and Jerry McGuire. Albany: SUNY Press, 1995. 87-110. James, C. L. R. Beyond a Boundary. London: Hutchinson, c1963. Mongia, Padmini, ed. Contemporary Postcolonial Theory. London: Arnold, 1996. 127-8; 284-91; 329-31. Nandy, Ashis. The Intimate Enemy: Loss and Recovery of Self Under Colonialism. Delhi: Oxford University Press, 1983. Ranger, T. O. Dance and Society in Eastern Africa, 1890-1970: the Beni ngoma. London: Heinemann, 1975. Taussig, Michael. Mimesis and Alterity: A Particular History of the Senses. New York: Routledge, 1993. Young, Robert J.C.. Colonial Desire: Hybridity in Theory, Culture and Race. London: Routledge, 1995. Author: Abdennebi Ben Beya, c. 1998. Hello David, i would like to thank you for sharing the site for further source. From which university you are belonging? and what is your academic subject? its in real term easy and good. Thanks a lot. Thanks a lot. Great topic, great content.